Hoover is the most well-known brand of vacuums and floor cleaners on Earth. When it comes to using a Hoover for your home, nothing beats the quality and workmanship of a Hoover vacuum. 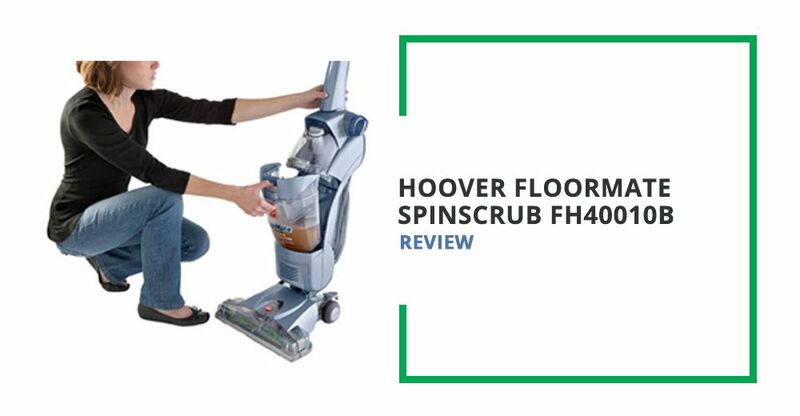 These statements are most certain true of the Hoover FloorMate SpinScrub FH40010B. This appliance is a vacuum and a floor cleaner for hard floors as opposed to carpets. Rather than a belt that turns an agitator to get into carpets, this device has scrubbers that turn sideways in a similar fashion to a street cleaner. The end result is a very clean floor, whether you have classic hardwood, vinyl, laminate, tile or ceramic. Dirt and grime don’t stand a chance. Who Needs the Hoover FloorMate SpinScrub FH40010B? What are The SpinScrub FH40010B Alternatives? Homeowners who have predominantly hard floors in their houses get the most out of this vacuum cleaner and floor scrubber. Use this dry for regular cleanings or add special solutions for more thoroughly scrubbings once per month or once per season. Cleaning your floors is no longer a chore, it’s a joy. This appliance has a ton of features that make this a must-buy appliance for when you have hard flooring in your home. This vacuum works well for times when regular once-overs just aren’t enough to get your floors clean. This appliance accomplishes three things at once. First, vacuum mode using plain suction to get rid of any dust and dirt on top of your hard floors. Second, wash mode uses liquid to give your floors a deeper clean in similar fashion to carpets. Much like a carpet cleaner, a jet of water comes in between the scrubbers as the SpinScrub picks up any caked-on or stuck-on dirt. Third, the drying stage quickly dries your floors so you don’t have any mess left behind when you’re done. The SpinScrub contains six counter-rotating brushes that contact the floor itself. The brushes gently wash the floor while scrubbing hard-to-reach crevices. This type of brush action works well on sealed vinyl floors, grout and tile. Just think how clean your kitchen and bathroom floors look after this amazing appliance gets done with them. You may never go back to dust mops or floor mops ever again. The one-year warranty indicates you have a high-quality appliance that doesn’t need to be replaced for a while. The handle folds down for convenient storage in your garage or closet. Rather than having to deal with the annoying handle that gets in the way of other things in your closet, free up a little more space thanks to the handle that folds down behind the appliance. Although the handle doesn’t fold inward into the main appliance, the feature does save space above the cleaner so you can fit it underneath a shelf or into a tighter space. Two tanks contain the water and cleaning solution used for wet cleanings. The first tank holds clean water, while the second tank is a reservoir to hold the dirty water. Hoover’s patented technology swiftly sweeps the water from one tank to the other so the dirty water doesn’t contaminate the clean tank. This makes your floor even cleaner since the dirt and grime gets whisked away quickly once the scrubbers do their work. Remove the nozzles and brushes after each use. Clean these parts in your sink with hot, soapy water and then dry them completely before securing them back into the SpinScrub. Even though they are detachable, these parts stay on the scrubber securely during cleaning. Definitely clean these parts every time to maintain the cleanest possible appliance and the best-looking floors. Have used this a few times and it is a dream of a floor cleaner. Requires very little of the Hoover brand cleaner in the dispenser, is neat to fill, rolls easy and does an excellent job of vacuuming loosened dirt before washing but only did that once. The control switch is easy to use in any of the 3 positions vacuum, wash or dry. I use it without pre-vacuuming on "wash" dispensing the cleaning solution with a switch on the handle and moving it too and fro to my pleasure. Then I turn the knob to dry and go over the same area. It's suctioned the dirt and water almost dry leaving only a trace of water. I use a dry mop to wipe up the few streaks left. It is easy to remove the dirty water and add detergent to the containers provided. I found only two drawbacks but tolerable. It is heavy and noisy. Heaviness is not a problem since I live in a one-floor house. It is noisy but other than that it exceeds all my expectations. Q: Do you have to use special cleaning fluid with this floor cleaner? A: No, you can use whatever cleaning fluid you want in the tanks. Consider certain tile cleaners, bleach-based solutions, sterilizing liquids and more. Q: How does this work on laminate floors? A: This cleaner works on laminate floors without the cleaning fluid or with very little cleaning fluid. Saturating a laminate floor with too much liquid may wear down the laminate over time, so be careful with laminate flooring. Make sure you use cleaning mode on sealed floors without any holes, cracks or crevices. How do I replace the dirty water tank? A: It pops out through the use of a lever and you can dump the waste water. The waste tank is small enough that it can be washed out easily. This is one of Hoover’s staple floor cleaning products going back several years. Even though newer models get updates in technology, the gold standard of floor care remains the same. The Hoover FloorMate SpinScrub FH40010B is a worthy appliance to purchase for all of your hard floor cleaning needs around the house. Hoover FloorMate Deluxe Hard Floor Cleaner, Moondust - This is a newer model and is lighter weight at just under 14lbs, makes it simple to transport upstairs. Can be purchased with a foldable handle if required. Has wash/Dry mode and can be controlled by touch which ables extra detergent to be added with ease. Water tanks are separate guaranteeing that dirty and clean water is not mixed. Shark Navigator Lift-Away Professional NV356E - This Shark Navigator is a lightweight 2-1 vacuum ideal for pet hair or allergens with HEPA filter. Its brush roll allows moving between hard floor areas and carpet with a simple switch of a button. With a dust bin capacity of 2.2 Quarts that ensures you don't need to empty it every five minutes. The Shark Navigator weighting only 13.7lb makes maneuvering it around the floor space a breeze.